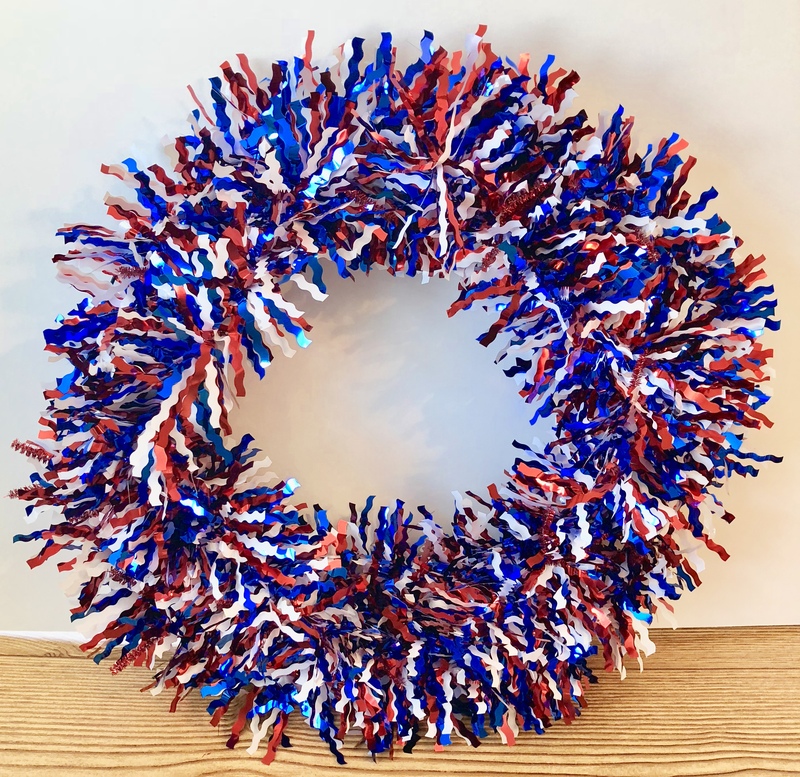 I was inspired to make a wreath by all the cute 4th of July decorations at Hobby Lobby. I picked up the tinsel garland, the pick, and the scrapbook paper there. I had this wire wreath frame that I had picked up at the Dollar Tree a few weeks ago. Supplies needed for this wreath. 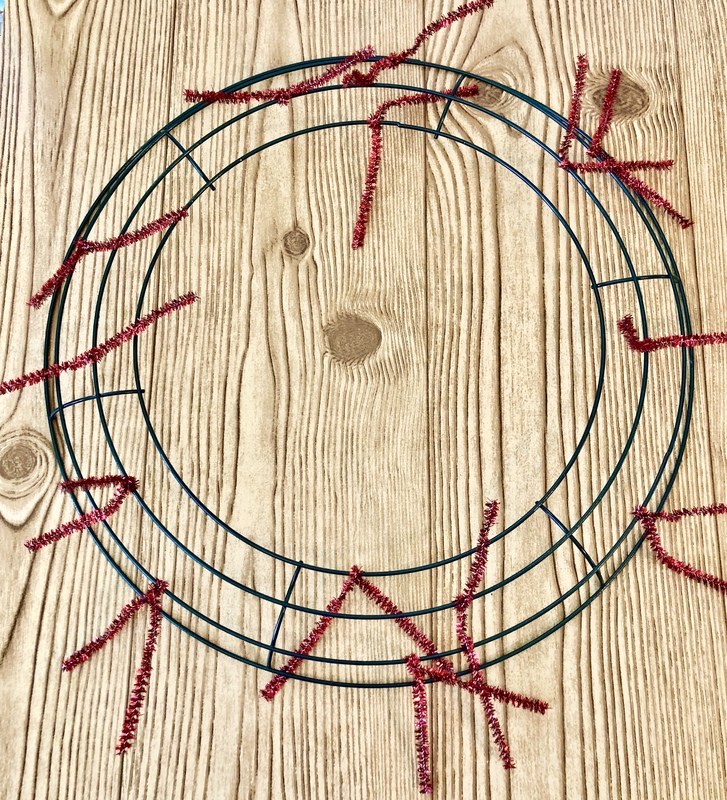 14″ wire wreath frame. I was lucky to find this one at Dollar Tree, but Amazon has a good price for a pack of three. Tinsel Garland I got my garland at Hobby Lobby for $3.49. Amazon has a cute pack of a 24-foot garland. My daughter loves to decorate for any holiday, so I invited her to help me with this wreath. She had originally wanted to make rockets with the toilet paper rolls, but we decided on firecrackers. 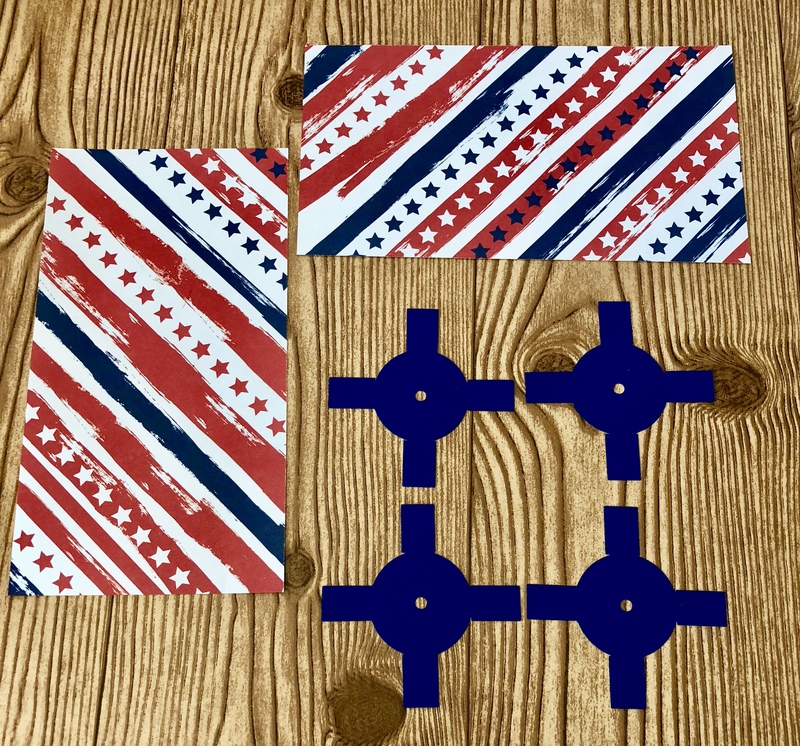 In order to turn our boring toilet paper rolls into firecrackers, I cut the scrapbook paper into rectangles measuring 4.5″ x 5.5″. I created the circles for the top and bottom of the rolls using my Cricut. I started with a circle a little larger than 1.5″ in diameter and added the rectangular tabs and welded them together. I then sliced a small circle out of the middle so I could add sparklers coming out of the top. I guess I could have cut the decorative paper with my Cricut too, but I just measured with a ruler and used a paper cutter. I cut the pipe cleaners in half and had my daughter attach them to the wire wreath form. Next, we attached the tinsel garland being sure to secure the garland with each pipe cleaner. Incidentally, shopping at Michaels I saw a wreath made with this same garland on sale for $9.99. Remember I bought my frame for $1.00 and the garland for $3.49. I have to admit that I got so caught up in the process with my daughter, that I forgot to take pictures of assembling the firecrackers. My daughter applied a little Modge Podge to the tabs on the circle end pieces for the firecrackers then attached them to the top and bottom of the toilet paper rolls with the tabs glued to the outside of the rolls. Next, she applied Modge Podge to the back of the decorative paper, and I helped her roll the paper around the tubes. We let those dry and applied a coat to the front of the paper as well. I am including a close of the finished firecracker attached to the wreath. I applied the Modge Podge on top of the paper to give it a nice finish and protect the paper. Because the firecrackers are made with paper, we are hanging the wreath inside to protect it from the elements. I cut the pick I bought in half and added some sparkly pipe cleaner to it. I secured it with tape and then we inserted it through the hole in the circle. 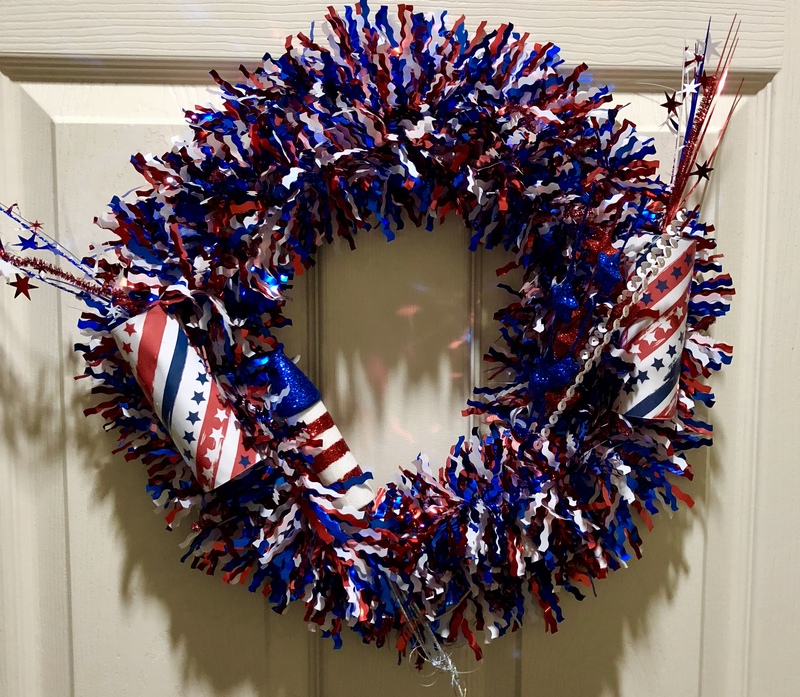 I hot glued a pipe cleaner to the back and used that to secure the firecrackers to the wreath. I felt the wreath looked a little too plain, so I picked up a couple more picks to add to it. The additional picks I purchased at Hobby Lobby did not cost much. 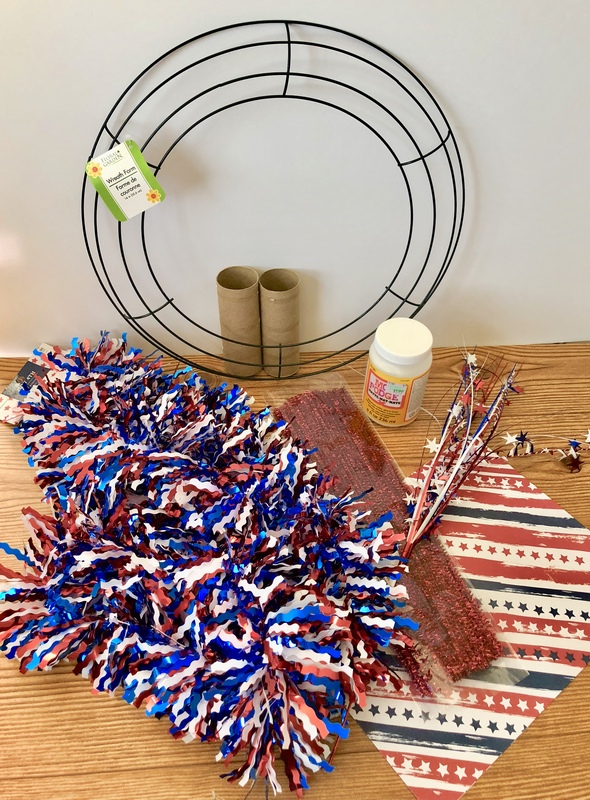 The colorful spray was less than $1.00 and the rocket cost $3.50 and came with two other rockets I am using for another wreath. So, for around $7.00 we made a cute wreath, and had a lot of fun doing it!